I honestly have not been diagnosed, but all my symptoms point to gout. I am a 34 year old female who is being told it is impossible to have Gout at my age, even though I have read that people as young as 19 have developed this. Here is how it all started. In October of 2010, I slightly sprained my ankle running in the rain. It hurt a little at first, but the pain kept worsening over the next two weeks. I finally couldn't take it anymore and went to the ER. They did x-rays told me I had a sprain, wrapped my ankle and foot in an ace bandage, gave me crutches and sent me home saying it would heal in a few weeks. Two days later, my ankle swelled to the point of screaming pain. I went back to the hospital where they x-rayed again, put me in one of those casts that is hard on the bottom and wrapped it with ace bandage. They were convinced I was walking on it, even though I wasn't and had no reason to lie. I was screaming the entire time they were casting me. Couldn't even believe they would put a cast with all that swelling. The next morning, I woke up screaming and crying from the pain. 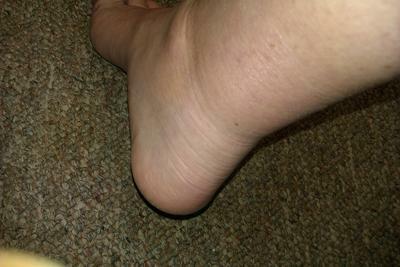 I took off the cast and my entire foot swelled up to where I couldn't seperate my toes. I went back to the ER and they told me they can't do anything and the doctor was really mean and told me to see an Orthopedic doctor. At the same time, I was having severe pain in my knee and calf. They did an ultrasound and said I have a ruptured Baker's Cyst and that is just all the fluid from it in my foot. There is no way in hell all that came from a cyst. A friend said I might have gout, but when i told the Ortho, he got super pissed and said there is no way it is Gout and told me I probably have RSD/CRPS which is a terrible nerve illness. Unfortunately, I had all the symptoms. I had an MRI done which showed nothing but profuse swelling. did not go down until I walked again. I saw another Ortho doctor who told me that most likely I had RSD/CRPS and told me to go to pain management for a nerve blocker, which was horrible but I did it hoping it would help. 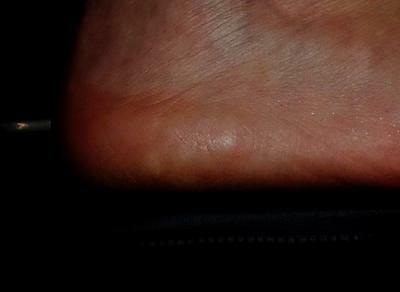 After the swelling went down, I noticed two small, hard lumps at the sole of my directly in line with outside my ankle bone. I pointed these out to the pain doctor who said she didn't know what they were and acted like I shouldn't worry about it. The pain doctor also said she had RSD/CRPS and was cured and was absolutely positive I don't have it and that it must be neuropathy. I gave up until the horrendous pain and swelling came back for no apparent reason. I went back to the Ortho who ignored the lumps in my foot and told me I may have Guillain-Barre. I went to a Neurologist who told me definitly not Gullain Barre and most likely neuropathy. She also couldn't explain my lumps. Needless to say, I was like screw this, my foot hurts, it will probably always hurt. I was so tired of getting the run around that I decided that since I can walk, it wasn't worth it anymore to try and figure it out. I have been in pain every day since this began. Some days not so bad. Others are really bad. A few weeks ago, I hurt myself walking in high heels. I went to the Ortho doctor and he told me I strained my Achilles heel. He wrapped it in a Jones Dressing even though I told him my foot would swell. And of course it did, so I took off the wrapping and the swelling went down after a few days. I also stopped using the crutches. Now, I have more of those little lumps in my foot, about 6 of them, my ankle and foot constantly feel broken, my big toe is sore to where I feel like someone is peeling off my toenail and the joint hurts on the top and bottom of my foot. The ball of my foot also hurts like I stepped on a rock but I didn't. Please see the photos and tell me what you think. I have a podiatry appointment on 5-21-13.
over 4 years of my feet for no reason swelling with unbearable pain, hospital scans and doctors could not diagnose ??? we searched on line and found symptoms and all suggested Gout. Another trip to the doctors on the next flair up still nothing ? results are double the normal over 500 GOUT 4 YEARS LATER!!!!! I have been eating a lot of hamburger. I eat hamburger pretty much every day. I also had some tuna fish yesterday. I am not much of a wine drinker, but for the past few nights to relaxe me, I have drank maybe 3 oz per night of Arbor Mist wine. It has the flavor of a red wine with fruit. Thank you for yor advice. I am going to make an appointment with my primary for the blood work and such. I think it would be better to start off with her so she can tell me who to go see as far as a specialist. I don't want to keep paying for the wrong doctor. I am not sure if I can wait until my insurance kicks in 5-21-13. The pain is getting to the point I can barely walk and I have a strange vibration feeling in my foot. Last night I pressed on the top of it and there was this pain that had me doubled over crying and I couldn't cover my foot or rest it. I had to fall asleep with it hanging off the edge of the bed so nothing would touch it. My foot feels like it is on fire, but there is no redness or swelling right now. Just a hot feeling and it feels broken and I can feel my toes swelling again. If I cross my legs and leave my foot hanging, it makes it hurt more. I feel like I need to go to the ER, but after the last fiasco, I am nervous. My poor husband is at a loss. He doesn't know what to do to help me and I see how much my suffering is hurting him which makes this even tougher for me. Firstly I am not a doctor but in saying this, here are a few suggestions that may help. 2. Get a blood sample taken and checked by the doctor for Uric Acid levels. 3. Look at your diet, have you eaten lots of seafood, red meat, or had a bit of alcohol. 4. Get the doctor to check for Pseudogout which has calcium pyrophosphate crystals heading to the extremities and is also a calcium pyrophosphate dihydrate crystal deposition disease. 5.It could be a form of Arthritis, so you may need to see a rheumatologist. 6. Just keep trying to get more information. Please let us all know how you went.